Laurel Road, a Division of Darien Rowayton Bank, was founded in 2006. 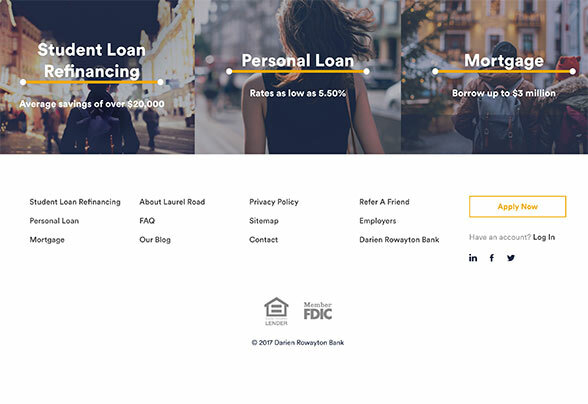 The bank, based out of Connecticut, has expanded out of its original location to offer nationwide services thanks to their ongoing efforts to create a strong online presence. Laurel Road offers student loan refinancing and unsecured personal loans. The bank’s customer-centric focus has guided them in creating credit services that offer some of the lowest rates available in the market to go with friendly terms and flexible repayment options. Laurel Road has quickly become a national mainstay in the student loan industry, especially amongst recent graduates and younger demographics who require some assistance with elevated levels of debt. Laurel Road’s services make it an ideal partner for young, recent graduates who are looking for sustainable ways to pay their student loans while building their careers. Laurel Road’s services are geared toward this younger demographic, with offerings such as student loan refinancing and consolidation. Moreover, they are able to offer low rates that are ideal for graduates who are looking to avoid overpaying interest on their existing loans. Their interest rates are incredibly low because the company prefers to work with lower-risk borrowers who generally already have good credit standing. Laurel Road offers some debt forgiveness, though usually only for cases of extreme duress—such as a significant reduction in income due to disability—or death. Overall, Laurel Road’s services are an excellent choice for young adults who are looking to fast-track their futures without the burden of student loan debt. When you are ready to get started with Laurel Road’s student loan refinancing, it is very easy to access the funds you need. The first step is to fill out an online form through Laurel Road’s website, which will include a soft credit check. This will determine if you prequalify for refinancing. This prequalification makes the loan process significantly more efficient. Once completed, you will be prompted to upload your documentation. After Laurel Road reviews your application and documents, they will send you a promissory note that includes your interest rate, terms, and important disclosures for you to approve and sign. As soon as that is signed and returned, Laurel Road will repay your existing loans and offer you the opportunity to sign up for electronic fund transfers to receive a discount of up to 0.25%. The company is committed to low interest rates, with fixed rates ranging from 4.45% to 7.45%, and variable rates starting at 3.89% up to 6.54%. We were pleased to see that Laurel Road can help you refinance both private student loans and Federal loans. The bank does note that for Federal loan refinancing, you will lose access to benefits such income-based repayment and pay-as-you earn programs. Another major positive for Laurel Road is their loan amounts, which start from a minimum of $5,000 but can reach as high as the full amount of your outstanding student loans. Additionally, you can earn money from Laurel Road simply by referring friends and family to their personal and student loan services. For every person referred who qualifies for a loan, you are entitled to receive a $300 bonus, and there is no limit to the number of times you may refer borrowers or receive the benefits. Laurel Road is also very transparent about their fees and charges. The bank does not charge you an origination or loan prepayment fee, although they do include late fees which is the lower amount of 5.00% or $28 as well as a $20 surcharge for any returned checks or electronic payments. After you are approved for a refinancing loan, you may choose between terms of 5, 7, 10, 15, and 20 years, a testament to the repayment flexibility Laurel Road offers. With all available loan terms, you may choose between variable or fixed rates. Thanks to the bank’s commitment to working with borrowers in good standing, quoted rates are amongst the best available in the market. Laurel Road clearly displays their repayment terms, rates, and other important details on their website, making it easy to find all the important details you need when exploring refinancing. If you have more questions, the bank offers in-person consultations at any of their locations in Connecticut. Furthermore, if you want to access even better repayment terms and rates, you can also include a co-signer in your application. Laurel Road takes their customers’ security and privacy concerns seriously. They take the necessary steps to provide industry-standard practices to ensure your data’s safety. The bank does collect some data related to your browsing for advertising and marketing purposes, but your information is kept anonymous and stored securely. Additionally, the company’s servers are protected by both physical and electronic security measures and redundancies to avoid hacking, data theft, or even loss because of accidents or natural disasters. If you require assistance, Laurel Road can help you through several different channels. If you prefer to speak to a service representative in person, you can visit any of the bank’s locations throughout Connecticut. If you are not in the state, you can still contact the bank via telephone or e-mail six days a week during regular business hours. We found the bank’s representatives to be well-informed and courteous when responding to our inquiries. Additionally, e-mail queries were responded to promptly, generally within one business day. Overall, Laurel Road offers strong student loan services, although the bank does have some room for improvement. We would like to see a clearer explanation of the company’s underwriting requirements to make it easier to prepare ahead of time. 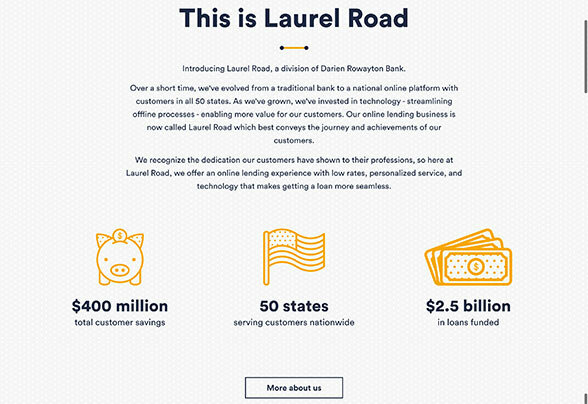 Laurel Road could improve its educational services, adding a knowledge base or video tutorials that could help customers understand the lending process and its consequences. The bank could also add a co-signer release, letting them be removed from the loan after a period of on-time payments. Low variable and fixed interest rates make refinancing a real possibility. The bank can work with both private and Federal student loans. In-person assistance for customers is available in the Connecticut area. Interest rate discounts are offered to borrowers opting to activate electronic fund transfers. The referral program gives you $300 for every person you refer that is approved for a personal or student loan. 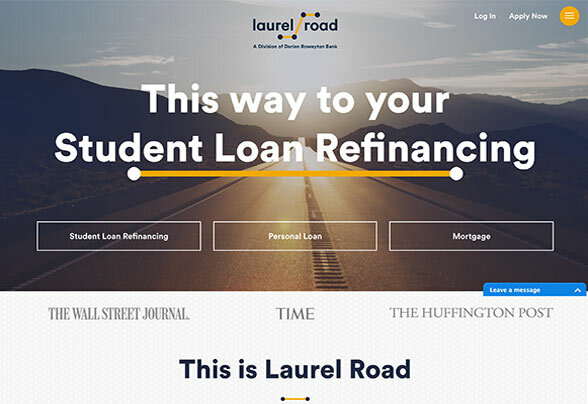 Laurel Road is quite unique in its commitment to helping young professionals fast-track their careers and lives by helping them refinance their outstanding debt. We were happy to see the bank’s dedication to offering low rates and flexible repayment terms that can fit a variety of circumstances and requirements. Additionally, the bank furnishes excellent incentives such as discounts and referral bonuses, allowing you to save and make money even as you gradually pay off your refinanced student loan. Laurel Road’s customer support and in-person assistance also make it appealing, as you can rest easy knowing that there is someone ready to answer any doubts or issues that may arise regarding your student loan. We were impressed with the company’s emphasis on young adults who require help that is not always available to them. Overall, Laurel Road delivers an excellent alternative for your student loan refinancing needs.